Hey Guys! Lets talk Carrots!!! Not the carats that we associate with the size of a wedding ring or a just-because-gift, but the one that’s long, orange, and is the root of a plant that is eaten as a vegetable…the one that Bugs Bunny loved. Yeah, that’s the one. CARROTS! Here’s a little fun fact – For the most part, we think of carrots as being only orange, but they can also be white, yellow, red, and even purple. Did you know that people first grew carrots for medicine, and not food, to combat a variety of ailments? And the reason for that is because of something called beta-carotene–a yellow/orange pigment that gives fruits and vegetables its vibrant colors. But, to take beta-carotene a little further, when it enters the body, its converted into vitamin A; which is needed for healthy skin, our immune system, and for the health of our eyes and vision. So come with me and lets take a ride into the wonderful world of carrots! Improves Vision – Carrots are high in beta-carotene and when it enters the body it’s transformed into vitamin A in the liver, and then the vitamin A is converted in the retina, to rhodopsin which is a purple pigment necessary for night vision. Helps Prevent Cancer – Research has shown that carrots reduce the risk of lung cancer, breast cancer and colon cancer. Due to falcarinol and falcarindiol which they believe cause the anticancer properties. Lower Cholesterol – Eating carrots or drinking carrot juice regularly will decrease cholesterol levels due to the soluble fibers in carrots binding with bile acids. Cleanses the Body – Vitamin A helps the liver flush toxins out of the body. The fibers that are existent in carrots help cleanse out the colon. Plaque Be Gone – Carrots clean your mouth and teeth. Carrots builds saliva, which being alkaline can balance out the acid and cavity forming bacteria. 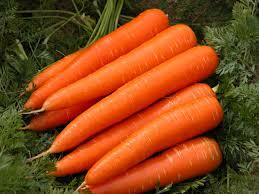 Treatment of Skin Ailments – Carrots are efficient in preventing and curing various skin issues. the antioxidants found in carrots can treat conditions such as pimples and acne, rashes and other skin problems brought on by a lack of vitamin A.Wondering how to incorporate carrots into your beauty regimen? Grind the grated carrots to smooth paste. Collect this carrot paste in a small bowl and add all the remaining ingredients to it. Blend well with a spoon and your quick homemade carrot moisturizing facial mask is all ready to use! Cleanse your face with a gentle facial cleanser (Raw Honey would work ) and apply this carrot mask evenly over your skin. Let it sit on your face for 10-15 minutes. Rinse with warm water. Pat dry to see your soft, glowing and of course moisturized skin. As you can see carrots can be beneficial in many ways. Juice them, dip them, turn them into a carrot cake (tasty!) add them to your beauty routine, or just eat them.Anyway you slice, or dice it, you can’t go wrong because carrots are healthy and full of nutrition. Join us for one of the most exciting, fulfilling times you can have with God: The 40-Day Surrender Fast. Cycle 9 of the Surrender Fast begins Feb. 23. REGISTER TODAY!